NFAT is a family of transcription factors important in the regulation of cytokine genes and is widely expressed in different lymphoid and nonlymphoid tissues. Consequently, the role of NFAT in CD4+ T cells during an in vivo immune response is not completely clear. In this study, we use transgenic mice expressing a dominant negative NFAT mutant exclusively in T cells to address the role of NFAT in T cells during a Th2 immune response in a model of allergic airway inflammation. We have observed that inhibition of NFAT in T cells results in a reduction of Ag-specific Th2 Ab levels and IL-4 production by CD4+ T cells. The accumulation of eosinophils in the bronchoalveolar lavage is delayed in dominant negative NFAT-transgenic mice. These mice are also more resistant to the development of lung pathology in response to allergen exposure. We, therefore, conclude that activation of NFAT in CD4+ T cells is required for the development of a Th2 immune response in vivo and allergic airway inflammation. Nuclear factor of activated T cells is a transcription factor originally identified in T cells to regulate the IL-2 promoter (1). NFAT has been shown to control a wide variety of genes encoding proteins of immunological interest such as IL-4, Fas ligand, and IL-2Rα (2, 3). There are four members of the NFAT family (NFATc1, NFATc2, NFATc3, and NFATc4) that are expressed in several immune cells such as B cells, mast cells, eosinophils, and NK cells as well as nonimmune tissues such as smooth muscle, intestine, skin, heart, and connective tissue (4, 5). In resting T cells, NFAT is highly phosphorylated and resides mainly in the cytosol (6). TCR ligation induces the activation of the calcium-responsive phosphatase, calcineurin, which dephosphorylates NFAT to allow its nuclear accumulation (7, 8). Nuclear export of NFAT is facilitated by phosphorylation by kinases such as glycogen synthase kinase 3 (9), c-Jun N-terminal kinase (10, 11), p38 mitogen-activated protein kinase (12), and casein kinase II (13). NFATc1 and NFATc2 are also regulated at the level of expression (14, 15). NFATc1 is further regulated by alternative splicing and usage of different promoters, resulting in three isoforms with differing functions (16, 17). Elucidation of the specific roles of individual NFAT family members in T cells has been challenging because of overlapping expression patterns of different members. Moreover, analysis of NFAT function in T cells during an in vivo Th2 immune response is complex due to functions of NFAT in many tissues. NFATc1-deficient mice are embryonic lethal due to a defect in cardiac development (18, 19). NFATc1-deficient T cells show reduced proliferation, activation, and IL-4 production (20, 21). NFATc2-deficient T cells exhibit hyperproliferation and dysregulated IL-4 gene expression and enhanced Th2 immune response (22, 23, 24, 25, 26). Mice lacking NFATc3 show impaired thymic development (27). Combined deletion of NFATc1 and NFATc2 results in reduced cytokine production (28), while deletion of NFATc2 and NFATc3 causes increased cytokine production (29). Deletion of NFAT members also results in altered subcellular localization or expression of remaining NFAT members (15, 30). Furthermore, the T cell phenotype observed in these mice could be due to disruption of NFAT in other cells or tissues. Thus, gene targeting approaches have been limited in clearly defining the role of NFAT in control of genes such as IL-4 in T cells and implications for Th1/Th2 immune responses. Effector Th2 cells are critical for the development of allergic asthma. Production of Th2 cytokines by CD4+ T cells lead to elevated IgE and IgG1 levels, eosinophilia, lung inflammation, and damage (31, 32, 33). In the current study, we have examined the role of NFAT in T cells during the development of allergic airway inflammation. We show that inhibition of NFAT exclusively in T cells impairs the development of a Th2 immune response in vivo and prevents the lung pathology associated with allergic airway inflammation. Thus, activation of NFAT and IL-4 production by CD4+ T cells is critical for the progression of allergic airway inflammation. Anti-CD3 mAb (145-2C11), anti-CD28 mAb (BD PharMingen, San Diego, CA), IL-6 (R&D Systems, Minneapolis, MN), and IL-4 (R&D Systems) were used for T cell activation and differentiation. Dominant negative (dn)3 NFAT-transgenic (Tg) mice (34) have been backcrossed onto the B10.BR background for more than 10 generations. The dnNFAT mutant inhibits endogenous NFAT DNA binding and NFAT-mediated transcription by 70–80%, but does not affect AP-1 or NF-κB DNA binding. T cells from these mice are found in normal proportions, exhibit normal proliferation, and have a normal naive/memory phenotype (15, 34). All mice were used between 8 and 12 wk of age and transgene-negative littermate controls were used as wild-type (WT) mice in each experiment. Procedures that involved mice were approved by the University of Vermont Institutional Animal Care and Use Committee. Mice were immunized i.p. with a 100-μl injection containing 20 μg of OVA (grade V; Sigma-Aldrich, St. Louis, MO) or PBS adsorbed to 2.25 mg of aluminum hydroxide (Pierce, Rockford, IL) on days 0 and 7. Mice were placed in a custom-made exposure chamber (University of Vermont Instrumentation and Modeling Facility) and challenged with a nebulized (Pari-II; Pari Respiratory Equipment, Monterey, CA) solution of 1% OVA in PBS for 30 min per day. Four experimental groups were examined: 1) mice immunized with PBS and challenged with PBS (PBS/PBS), 2) mice that were immunized with OVA and challenged with PBS (OVA/PBS), 3) mice immunized with PBS and challenged with aerosol OVA (PBS/OVA), and 4) mice that were immunized with OVA and challenged with OVA (OVA/OVA). For analysis of chronic pulmonary inflammation, mice were sensitized on days 0 and 7 with OVA or PBS and were then challenged with aerosolized OVA once per day for 3 consecutive days on days 14, 15, and 16. Animals were sacrificed for analysis on day 18, 48 h after the third aerosol challenge. For analysis of more acute pulmonary inflammation, mice were sensitized with OVA as above and then challenged with aerosol OVA once per day for 30 min on days 14 and 15. Animals were sacrificed and analyzed 12 h after the second OVA challenge. Serum was obtained from anesthetized mice (pentobarbital sodium, 70–90 mg/kg) by orbital eye bleed using heparinized capillary tubes. Plates were coated with 0.5 μg/ml OVA and relative OVA-IgE and OVA-IgG1 levels were measured by ELISA using biotinylated anti-IgE or anti-IgG1 mAbs (1 μg/ml; BD PharMingen) according to the manufacturer’s instructions. Tracheas were cannulated with a rounded 18-gauge needle, 1 ml of cold PBS was instilled into the lungs twice, and the BAL fluid was collected. Cells were pelleted and counted using a white blood cell counting solution (1% crystal violet, 1% acetic acid). Cells (25 × 103) were cytospun onto glass slides and stained with Hema-3 (Biochemical Sciences, Swedesboro, NJ). Three hundred cells per slide were counted and scored as macrophages, eosinophils, neutrophils, or lymphocytes based on characteristic morphology and staining. CD4+ T cells were isolated from the mediastinal lymph nodes (MLN) by negative selection as described previously (35) using a combination of anti-MHC class II (m5/115), anti-CD8 (TIB105), anti-NK1.1 (BD PharMingen), and anti-Mac-1 mAb (BD PharMingen). Total RNA was extracted using Ultraspec RNA Isolation Reagent (Biotecx Laboratories, Houston, TX) and first-strand cDNA was synthesized using random primers (Promega, Madison, WI) and Superscript II reverse transcriptase (Invitrogen, San Diego, CA). Quantitative RT-PCR was performed on cDNA using a predesigned IL-4 primer/probe set (Assays on Demand; Applied Biosystems, Foster, CA) and a custom-designed γ-actin primer/probe set. The γ-actin probe and primer sequences were: probe, 5′-6-FAM-d(CATTGCTCCCCCTGAGCGCAA)-BHQ-1–3′; forward primer, 5′-d(GCACCTAGCACGATGAAGATTAAGA)-3′; and reverse primer, 5′-d(AGCCACCGATCCAGACTGAGT)-3′ (Biosearch Technologies, Novato, CA). PCRs were performed using the TaqMan Universal PCR Master Mix and the Applied Biosystems PRISM 7700 Sequence Detection System. The level of IL-4 expression was normalized to γ-actin housekeeping gene levels and relative IL-4 mRNA levels were determined with the equation 2−ΔΔCT according to the comparative cycle threshold method (Applied Biosystems). Lungs were processed for histological analysis as described previously (36) and stained with H&E according to routine procedures. Total CD4+ T cells from spleen and lymph nodes were activated with plate-bound anti-CD3 (5 μg/ml) and soluble anti-CD28 (1 μg/ml) mAbs in the presence or absence of the corresponding cytokine. For the generation of effector Th2 cells, the cells were extensively washed after 4 days of activation and restimulated with plate-bound anti-CD3 mAb (5 μg/ml) alone for 24 h.
ELISAs were performed with purified anti-IL-4 or anti-IL-5 mAb (2 μg/ml; BD PharMingen) as capture Ab, the corresponding biotinylated anti-IL-4 or anti-IL-5 mAb (1 μg/ml), HRP-conjugated streptavidin (Sigma-Aldrich), and the tetramethylbenzidine microwell peroxidase substrate and stop solution (Kirkegaard & Perry, Gaithersburg, MD) according to the recommended protocol (BD PharMingen). Recombinant mouse IL-4 and IL-5 (R&D Systems) were used as standards. Determination of statistical significance for serum Ab levels between WT and dnNFAT Tg mice was conducted using two-way ANOVA for multiple points of comparison. Histological data were compared by two-way ANOVA with the Bonferroni posttest. For all other experiments, statistical significance was determined by the Student’s t test. For all analyses a p < 0.05 was considered statistically significant. The role of NFAT in T cells and its contribution to a Th2 immune response in vivo remains unclear. To specifically test whether NFAT activation in T cells is required for the development of an in vivo Th2 immune response, we assessed allergic airway inflammation in Tg mice that express a dnNFAT mutant selectively in T cells (15, 34). WT or dnNFAT mice were sensitized with i.p. PBS or OVA adsorbed to aluminum hydroxide on days 0 and 7. Mice were then challenged with an aerosol containing PBS alone or OVA on days 14, 15, and 16. Two days after the last challenge, OVA-specific IgE levels in serum were determined by ELISA as a hallmark of a Th2 immune response. As expected, no detectable levels of OVA-specific IgE were found in WT or dnNFAT Tg mice that were immunized with PBS and challenged with PBS aerosol (PBS/PBS) (data not shown). Similarly, no OVA-specific IgE was detected in WT and dnNFAT Tg mice that were immunized with OVA and challenged with PBS aerosol (OVA/PBS) or immunized with PBS and challenged with OVA aerosol (PBS/OVA) (data not shown). WT mice that were immunized with OVA and challenged with OVA aerosol (OVA/OVA) exhibited high levels of OVA-specific IgE (Fig. 1⇓A). In contrast, OVA/OVA dnNFAT Tg mice had substantially lower levels of OVA-specific IgE in serum (Fig. 1⇓A). Reduced Ag-specific Th2 Ig levels in dnNFAT Tg mice. A, Transgene-negative littermate controls (considered WT) and dnNFAT Tg mice (Tg+) were sensitized with OVA and challenged with aerosolized OVA during 3 consecutive days. Forty-eight hours after the last exposure, serum was obtained and relative OVA-specific IgE levels were determined by ELISA using several dilutions of serum. B, OVA-specific IgG1 levels were determined as in A. Data presented are the means ± SEM of one representative experiment of four performed with four mice per group. Statistical significance was determined by two-way ANOVA. Statistically significant differences in the levels of OVA-IgE (p < 0.001) and OVA-IgG1 (p < 0.001) over the ranges of serum dilutions analyzed were observed between WT and Tg+ mice. We also analyzed OVA-specific IgG1 levels, another hallmark of a Th2 response. As predicted, PBS/PBS, PBS/OVA, and OVA/PBS WT and dnNFAT Tg mice had undetectable OVA-specific IgG1 levels (data not shown). We found high levels of OVA-specific IgG1 in OVA/OVA WT mice, but the levels of OVA-specific IgG1 were also lower in OVA/OVA dnNFAT Tg mice (Fig. 1⇑B). OVA-specific IgG2b levels were slightly lower in OVA/OVA dnNFAT Tg mice than in OVA/OVA WT mice (data not shown). OVA-IgG2a levels were undetectable in OVA/OVA WT and dnNFAT Tg mice (data not shown). We conclude that activation of NFAT in T cells is required for maximum production of Ag-specific Th2 Ig subtypes during an in vivo Th2 immune response. During the development of allergic airway inflammation, eosinophils are recruited to the lung and contribute to pulmonary inflammation (31). We examined eosinophils in the BAL of PBS/OVA or OVA/OVA WT and dnNFAT Tg mice 48 h after the third challenge (one challenge per day for 3 consecutive days). 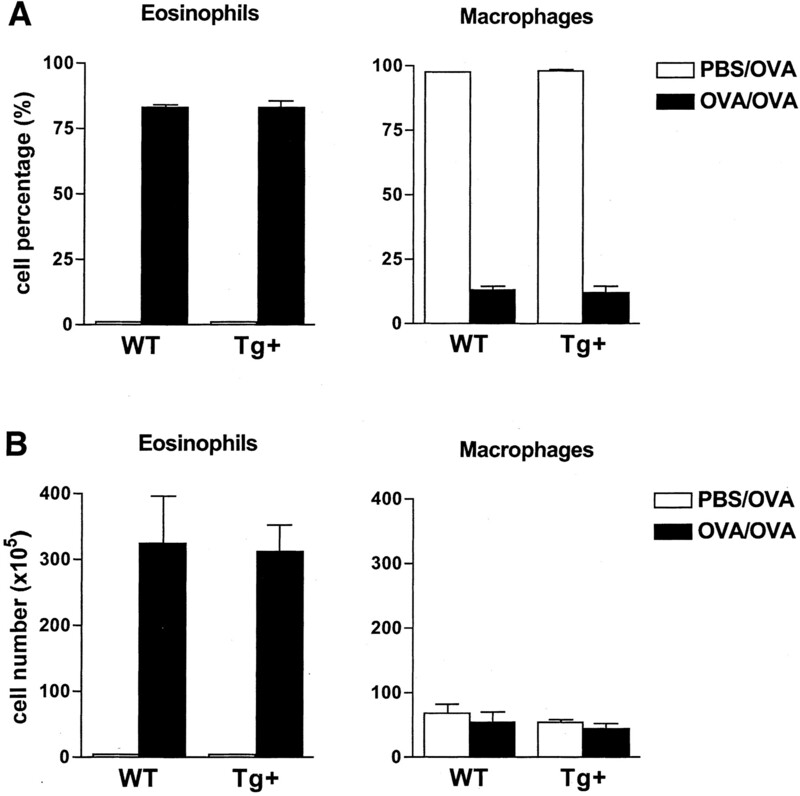 Although virtually no eosinophils were found in the BAL of PBS/OVA WT mice, the percentage of eosinophils in the BAL increased dramatically in OVA/OVA WT mice (Fig. 2⇓A). Interestingly, we observed a similar increase in the percentage of eosinophils in the BAL of OVA/OVA dnNFAT Tg mice (Fig. 2⇓A). 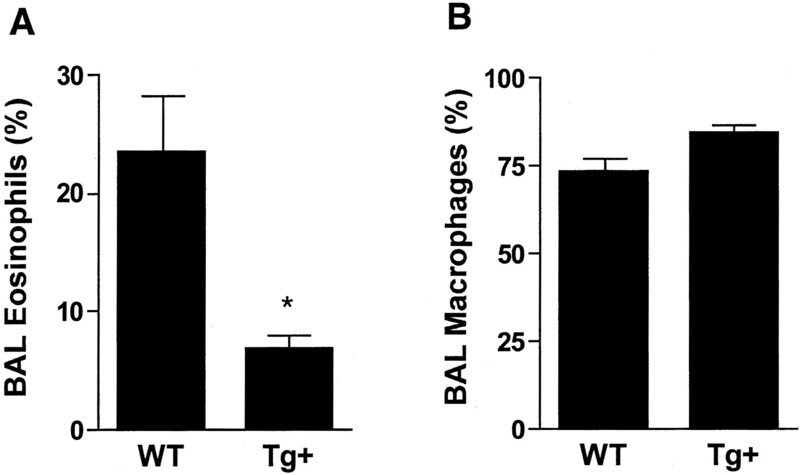 The percentage of macrophages in the BAL was also equivalent among OVA/OVA WT and dnNFAT Tg mice (Fig. 2⇓A). Furthermore, the total number of eosinophils and macrophages in BAL were similar in WT and dnNFAT Tg mice exposed to OVA/OVA (Fig. 2⇓B). No differences in the percentage or total number of BAL neutrophils and lymphocytes were detected between OVA/OVA WT and dnNFAT Tg mice (data not shown). These results suggested that inhibition of NFAT in T cells did not interfere with the accumulation of eosinophils in the BAL during allergic airway inflammation. Late airway eosinophilia is not affected in dnNFAT Tg mice. WT and dnNFAT Tg (Tg+) mice were immunized with PBS and challenged with OVA (PBS/OVA) or immunized with OVA and challenged with OVA for 3 consecutive days (OVA/OVA). Forty-eight hours after the last challenge, cells from the BAL fluid were cytospun and stained with Hema-3. Eosinophils and macrophages were identified on the basis of morphology and staining characteristics. The percentage (A) and number (B) of eosinophils and macrophages recovered in the BAL are shown. Data are means ± SEM of four mice per group from one representative experiment of three that were conducted. We also examined the presence of eosinophils in BAL at an earlier time point following the initiation of allergic airway inflammation. Mice received only two challenges (one challenge per day for 2 consecutive days) instead of three and BAL was collected 12 h after the second challenge. The proportion of eosinophils in BAL from both WT and dnNFAT Tg mice at this early time point was substantially lower than that recovered 48 h after three challenges (Figs. 2⇑A and 3⇓A). Nevertheless, we found a reduction in the percentage of eosinophils recovered in BAL from dnNFAT Tg mice compared with the percentage in WT mice at this early period of time (Fig. 3⇓A). In accordance with decreased BAL eosinophilia in dnNFAT Tg mice, we observed a small increase in the proportion of macrophages in these mice (Fig. 3⇓B). Together, these results suggest that activation of NFAT in T cells is required for the initial stages of the accumulation of eosinophils in BAL. Early eosinophil lung recruitment is reduced in dnNFAT Tg mice. WT and dnNFAT Tg (Tg+) mice were sensitized with i.p. OVA and challenged once per day for two consecutive days with aerosol OVA. Twelve hours after the second challenge, BAL cells were recovered and the percentage of eosinophils (A) and macrophages (B) was determined. Data shown are means ± SEM (n = 6 for each group) and are representative of two independent experiments. Asterisk indicates significant difference between the groups (Student’s t test; p < 0.002). We examined the production of IL-4 and IL-5 (hallmark cytokines for Th2 effector cells) in vivo during the development of allergic airway inflammation in dnNFAT Tg mice. The levels of IL-4 present in BAL from dnNFAT Tg mice were lower than those found in WT mice (Fig. 4⇓A). In contrast, the levels of IL-5 were similar in WT and dnNFAT Tg mice (Fig. 4⇓B). These results show that local production of IL-4, but not IL-5, in the lung during a Th2 immune response requires NFAT activation in T cells. Reduced IL-4 levels in airways and MLN CD4+ T cells of dnNFAT mice. A, WT and dnNFAT Tg (Tg+) mice were sensitized with i.p. OVA and challenged twice with aerosol OVA. IL-4 levels in the BAL fluid were determined 12 h after the second challenge by ELISA (Student’s t test; p < 0.05). B, IL-5 levels in the BAL fluid of mice exposed as in A were determined by ELISA (n.s., not significant). C, CD4+ T cells were isolated from the MLN of WT or Tg+ mice sensitized and challenged with OVA as in A. Total RNA was used to examine IL-4 and γ-actin message levels were measured by real-time RT-PCR using specific primer/probe sets. IL-4 expression was normalized to γ-actin levels and the relative expression of IL-4 between WT and Tg+CD4+ T cells was determined by the comparative cycle threshold analysis method (p < 0.01). Data are means ± SEM (n = 6 for each group) and are representative of two independent experiments. To show that the reduced levels of IL-4 in BAL were due to decreased production of this cytokine by CD4+ T cells, we examined IL-4 mRNA levels in CD4+ T cells from the MLN. WT and dnNFAT Tg mice were sensitized with i.p. OVA and exposed to two aerosol challenges. CD4+ T cells were then isolated from MLN, total RNA was obtained and reverse transcribed into cDNA, and analyzed by real time RT-PCR for IL-4 gene expression. We found lower IL-4 mRNA levels in CD4+ T cells from dnNFAT mice compared with those found in WT mice (Fig. 4⇑C). These results demonstrate that NFAT activation in CD4+ T cells is required for these cells to differentiate into IL-4-producing effector cells in an in vivo Th2 immune response. Our results show that inhibition of NFAT in T cells decreased Ag-specific Th2 Ab production and IL-4 production by effector CD4+ T cells, but did not significantly affect eosinophilia. We examined whether these changes had an impact on the development of lung pathology during allergic airway inflammation. WT and dnNFAT Tg mice were sensitized with i.p. OVA and challenged once per day over 3 consecutive days with aerosol OVA (OVA/OVA). Lung histology was examined 48 h after the third challenge. PBS/PBS, OVA/PBS (data not shown), and PBS/OVA WT and dnNFAT Tg mice do not show signs of infiltration (Fig. 5⇓A). Large infiltrates surrounding airways were present in the lungs of OVA/OVA WT mice and associated with alterations (thickening and damage) of the airways (Fig. 5⇓A). Although most WT mice were scored as 2 or more (e.g., large infiltrates around most airways in the lung) in agreement with previous studies (37, 38), more dnNFAT Tg mice were scored as 1, consistent with minimal signs of infiltration (Fig. 5⇓, A and B). Thus, inhibition of NFAT in T cells also reduces the retention of infiltrated cells in the lung despite the normal accumulation of eosinophils in BAL at this late stage of inflammation. Consistent with this conclusion, the difference in lung pathology between WT and dnNFAT Tg mice was more profound when we examined the histology of lungs at an early stage of inflammation (12 h after only two challenges as described above; Fig. 5⇓C). It is unclear what is the main exogenous cytokine that initiates Th2 differentiation of CD4+ T cells in vivo. In addition to exogenous IL-4 (39), we have shown that IL-6 also polarizes naive CD4+ T cells into IL-4 producing effector Th2 cells in vitro (40). IL-6 induces early IL-4 gene expression through activation of NFAT (15). Exogenous IL-6, but not IL-4, is capable of enhancing NFAT-mediated transcription in CD4+ T cells (15). However, IL-4, but not IL-6, induces GATA-3 and other Th2 transcription factors (41). Since we have observed that differentiation of Th2 cells with IL-6 is totally dependent upon NFAT (15), we tested the role of NFAT in Th2 differentiation driven by exogenous IL-4 in vitro. CD4+ T cells were isolated from WT or dnNFAT Tg mice and stimulated with anti-CD3 and anti-CD28 mAbs in the presence of exogenous IL-6 or IL-4 for 4 days. Cells were then restimulated with anti-CD3 mAb alone for 24 h and IL-4 production was determined by ELISA. In correlation with our previous study, IL-6 promoted IL-4 production in WT CD4+ T cells, but this effect was abrogated in CD4+ T cells from dnNFAT Tg mice (Fig. 6⇓A). However, IL-4 induced normal Th2 differentiation in CD4+ T cells from dnNFAT Tg mice (Fig. 6⇓A), indicating that NFAT activation is not required for the differentiation of Th2 cells if exogenous IL-4 is present. NFAT is not required for IL-4-induced Th2 polarization. A, CD4+ T cells from WT or dnNFAT Tg mice (Tg+) (106 cells/ml) were stimulated with immobilized anti-CD3 mAb (5 μg/ml), soluble anti-CD28 mAb (1 μg/ml), and medium alone (−), IL-4 (100 ng/ml), or IL-6 (100 ng/ml). After 4 days, cells were extensively washed and restimulated for 24 h with immobilized anti-CD3 mAb (5 μg/ml). Supernatants were analyzed for IL-4 production by ELISA (Student’s t test; p = 0.001). B, CD4+ T cells WT or dnNFAT Tg mice (Tg+) were stimulated as in A and supernatants were analyzed for IL-5 production by ELISA. Data shown are the means ± SEM and are representative of two independent experiments. Since IL-4, but not IL-5 levels in BAL of dnNFAT mice were reduced, we examined the effect of NFAT inhibition in IL-5 production by Th2 cells in vitro. Interestingly, IL-6 did not promote the production of IL-5 by CD4+ T cells (Fig. 6⇑B). Moreover, IL-5 production by CD4+ Th2 cells differentiated in the presence of exogenous IL-4 was not affected by the presence of dnNFAT (Fig. 6⇑B). Together, these results demonstrate that inhibition of NFAT in T cells does not affect regulation of IL-5 production in vitro by Th2 cells. These results could explain the normal accumulation and expansion of eosinophils in dnNFAT mice at later stages during allergic airway inflammation. Several studies using mice deficient for one or two NFAT family members have attempted to address the role of NFAT in regulation of CD4+ Th1/Th2 differentiation (20, 21, 22, 24, 25, 29). The conclusions from these studies have been controversial due to potential compensation by other NFAT members, disruption of NFAT in other tissues that can influence the immune response, and spontaneous development of immune disorders. NFATc1/NFATc2 doubly deficient mice develop plasmacytomas while mice lacking NFATc2 and NFATc3 exhibit unprovoked cellular infiltration into tissues (28, 29). Moreover, deletion of NFATc2 and NFATc3 results increased nuclear localization of NFATc1 (29, 30). In this study, we have shown the requirement for NFAT specifically in T cells during the development of an in vivo Th2 immune response. Among the mice deficient for specific NFAT family members, only NFATc2-deficient mice have been examined for an in vivo Ag-specific immune response since these mice do not exhibit a major spontaneous immune disorder (24, 25, 26). 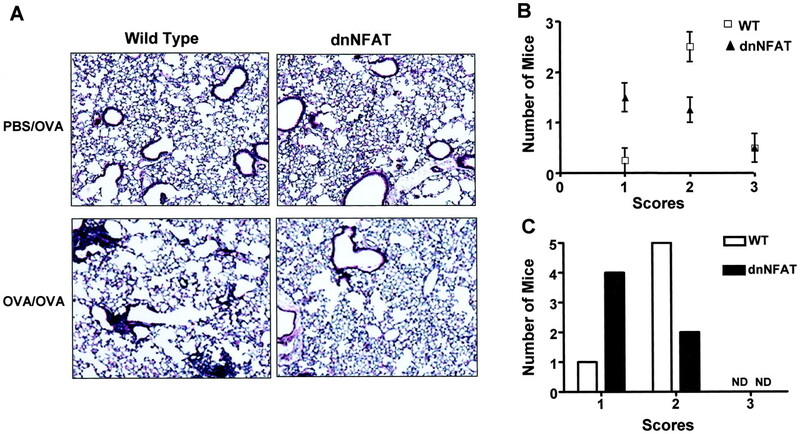 In contrast to our study, NFATc2-deficient mice exhibit enhanced OVA-induced pleural eosinophilia and increased allergic airway inflammation (25, 26), suggesting a negative role for NFATc2 in the regulation of an in vivo Th2 immune response. However, this phenotype could be explained by a selective accumulation of cells with an activated or memory phenotype (CD44high) and T cell hyperproliferation in these mice (22, 23). In contrast, expression of dnNFAT in T cells does not affect the naive CD4+ T cell phenotype and inhibits transcription mediated by all four NFAT members (34). Thus, we eliminate the compensation among NFAT family members and we prevent the potential effect of NFAT in other tissues that may affect the T cell phenotype. Several factors are sequentially involved in the regulation of Th2 differentiation by IL-4, but not all directly regulate the transcription of the IL-4 gene. STAT6 is rapidly induced by IL-4 signaling and is required for Th2 polarization (42, 43, 44), but does not directly regulate IL-4 transcription. STAT6 regulates the expression of GATA-3, another key Th2-specific transcription factor (41, 45, 46). GATA-3 does not directly regulate IL-4 gene transcription, but it induces chromatin remodeling of the IL-4 locus (47, 48). c-Maf is a transcription factor that directly activates IL-4 gene expression late in the establishment of the Th2 phenotype (49, 50). NFAT directly binds the IL-4 proximal promoter and these NFAT elements are required for transcription mediated from this promoter (51, 52). We have previously shown that IL-6 induces IL-4 production in CD4+ T cells through activation of NFAT (15). IL-6 also induces GATA-3 expression, but this effect is dependent on endogenous IL-4 (15), which uses the STAT6 and GATA-3 signaling pathways. We show here that NFAT is not required for Th2 differentiation driven by exogenous IL-4, indicating that the requirement for NFAT in Th2 differentiation may be bypassed, depending on the polarizing cytokine. The cytokine(s) responsible for initiating Th2 polarization in vivo has not been clarified. NKT (NK1.1+) cells have been proposed to promote Th2 differentiation since they can produce high levels of IL-4, but CD1-deficient mice that lack NKT cells are able to mount a normal Th2 immune response in vivo (53, 54). IL-6 produced by APCs drives Th2 differentiation by triggering the production of endogenous IL-4 by CD4+ T cells through the activation of NFAT (15). Combining our results indicating that 1) dnNFAT selectively inhibits IL-6-, but not IL-4-mediated Th2 differentiation in vitro and 2) inhibition of NFAT in T cells prevents a Th2 immune response in vivo, it suggests that IL-6 could be an important factor for Th2 differentiation in vivo. In correlation, a pulmonary Th2 response coincides with expression of IL-6 expression by APCs resident in the lung (55). Furthermore, mice expressing IL-6 in the lung exhibit lymphocytic infiltration and changes in lung morphology (56). Thus, IL-6 may promote the Th2 inflammatory environment in the lung during allergic airway inflammation. IL-4 is involved in the initial recruitment of eosinophils by stimulating expression of the eosinophil chemoattractant eotaxin and eosinophil transmigration through up-regulation of VCAM-1 expression (57, 58, 59). Thus, the impaired IL-4 production in dnNFAT Tg mice could explain the reduced number of eosinophils in BAL at early stages of pulmonary inflammation. IL-5 is a major growth factor for eosinophils and is important for eosinophil expansion in the lung during allergic airway disease (60, 61). Overexpression of IL-5 in T cells or in the lung can promote lung eosinophilia (62, 63). Since we did not observe decreased IL-5 levels in dnNFAT Tg mice and inhibition of NFAT did not affect IL-5 production by Th2 cells in vitro, this could explain why at late stages of allergic airway inflammation the accumulation of eosinophils in the lung is less affected. The role of eosinophils in the progression of allergic asthma is not completely clear (64, 65), but our results indicate that lung pathology induced by allergic inflammation can be decreased even in the presence of normal eosinophil accumulation in BAL. In conclusion, we demonstrate for the first time that the activation of NFAT in CD4+ T cells is required for the development of an in vivo Th2 immune response and allergic airway inflammation. Since we also show that NFAT is required for IL-6-directed Th2 differentiation, but not for IL-4-directed Th2 differentiation, it is possible that IL-6 could play a role in the initiation of Th2 differentiation in vivo. We thank Matt Poynter, Laurie Whittaker, and Juan Anguita for valuable advice. ↵1 This work was supported by National Institutes of Health Heart, Lung, and Blood Institute Grant RO1 HL69136 (to M.R.) and by the Center for Biomedical Research Excellence Program of the National Center for Research Resources Grant P20 RR15557 (to C.G.I.). S.D. was supported by an Environmental Pathology Training Grant from the National Institute of Environmental Health Sciences (T32ES07122). ↵3 Abbreviations used in this paper: dn, dominant negative; BAL, bronchoalveolar lavage; MLN, mediastinal lymph node; WT, wild type, Tg, transgenic. Shaw, J. P., P. J. Utz, D. B. Durand, J. J. Toole, E. A. Emmel, G. R. Crabtree. 1988. Identification of a putative regulator of early T cell activation genes. Science 241:202. Crabtree, G. R.. 1999. Generic signals and specific outcomes: signaling through Ca2+, calcineurin, and NF-AT. Cell 96:611. Schuh, K., T. Twardzik, B. Kneitz, J. Heyer, A. Schimpl, E. Serfling. 1999. The interleukin 2 receptor α chain/CD25 promoter is a target for nuclear factor of activated T cells. J. Exp. Med. 188:1369. Rao, J., C. Luo, P. G. Hogan. 1997. Transcription factors of the NFAT family. Annu. Rev. Immunol. 15:707. Serfling, E., F. Berberich-Siebelt, S. Chuvpilo, E. Jankevics, S. Klein-Hessling, T. Twardzik, A. Avots. 2000. The role of NF-AT transcription factors in T cell activation and differentiation. Biochim. Biophys. Acta 1498:1. Porter, C. M., M. A. Havens, N. A. Clipstone. 2000. Identification of amino acid residues and protein kinases involved in the regulation of NFATc subcellular localization. J. Biol. Chem. 275:3543. Clipstone, N. A., G. R. Crabtree. 1992. Identification of calceniurin as a key signalling enzyme in T cell activation. Nature 357:695. Beals, C. R., N. A. Clipstone, S. N. Ho, G. R. Crabtree. 1998. Nuclear localization of NF-ATc by a calcineurin-dependent, cyclosporin-sensitive intramolecular interaction. Genes Dev. 11:824. Beals, C. R., C. M. Sheridan, C. W. Turck, P. Gardner, G. R. Crabtree. 1997. Nuclear export of NF-ATc enhanced by glycogen synthase kinase-3. Science 275:1930. Chow, C.-W., M. Rincón, J. Cavanagh, M. Dickens, R. J. Davis. 1997. Nuclear accumulation of NFAT4 opposed by the JNK signal transduction pathway. Science 278:1638. Chow, C. W., C. Dong, R. A. Flavell, R. J. Davis. 2000. c-Jun NH2-terminal kinase inhibits targeting of the protein phosphatase calcineurin to NFATc1. Mol. Cell. Biol. 20:5227. Gomez del Arco, P., S. Martinez-Martinez, J. L. Maldonado, I. Ortega-Perez, J. M. Redondo. 2000. A role for the p38 MAP kinase pathway in the nuclear shuttling of NFATp. J. Biol. Chem. 275:13872. Zhu, J., F. Shibasaki, R. Price, J. C. Guillemot, T. Yano, V. Dotsch, G. Wagner, P. Ferrara, F. McKeon. 1998. Intramolecular masking of nuclear import signal on NF-AT4 by casein kinase I and MEKK1. Cell 93:851. Chuvpilo, S., A. Avots, F. Berberich-Siebelt, J. Glockner, C. Fischer, A. Kerstan, C. Escher, I. Inashkina, F. Hlubek, E. Jankevics, et alMultiple NF-ATc isoforms with individual transcriptional properties are synthesized in T lymphocytes. J. Immunol. 162:1999b7294. Diehl, S., C. W. Chow, L. Weiss, A. Palmetshofer, T. Twardzik, L. Rounds, E. Serfling, R. J. Davis, J. Anguita, M. Rincón. 2002. Induction of NFATc2 expression by interleukin 6 promotes T helper type 2 differentiation. J. Exp. Med. 196:39. Chuvpilo, S., M. Zimmer, A. Kerstan, J. Glockner, A. Avots, C. Escher, C. Fischer, I. Inashkina, E. Jankevics, F. Berberich-Siebelt, et al 1999. Alternative polyadenylation events contribute to the induction of NF-ATc in effector T cells. Immunity 10:261. Chuvpilo, S., E. Jankevics, D. Tyrsin, A. Akimzhanov, D. Moroz, M. K. Jha, J. Schulze-Luehrmann, B. Santer-Nanan, E. Feoktistova, T. Konig, et al 2002. Autoregulation of NFATc1/A expression facilitates effector T cells to escape from rapid apoptosis. Immunity 16:881. Ranger, A. M., M. J. Grusby, M. R. Hodge, E. M. Gravallese, F. C. de la Brousse, T. Hoey, C. Mickanin, H. S. Baldwin, L. H. Glimcher. 1998. The transcription factor NF-ATc is essential for cardiac valve formation. Nature 392:186.
de la Pompa, J. L., L. A. Timmerman, H. Takimoto, H. Yoshida, A. J. Elia, E. Samper, J. Potter, A. Wakeham, L. Marengere, B. L. Langille, et al 1998. Role of the NF-ATc transcription factor in morphogenesis of cardiac valves and septum. Nature 392:182. Yoshida, H., H. Nishina, H. Takimoto, L. E. M. Marengère, A. C. Wakeham, D. Bouchard, Y.-Y. Kong, T. Ohteki, A. Shahinian, M. Bachmann, et al 1998. The transcription factor NF-ATc1 regulates lymphocytes proliferation and Th2 cytokine production. Immunity 8:115. Hodge, M. R., A. M. Ranger, F. Charles de la Brousse, T. Hoey, J. Grusby, L. H. Glimcher. 1996. Hyperproliferation and dysregulation of IL-4 expression in NF-ATp-deficient mice. Immunity 4:397. Schuh, K., B. Kneitz, J. Heyer, F. Sieblet, C. Fischer, E. Jankevies, E. Rúde, E. Schmitt, A. Schimpl, E. Serfling. 1997. NF-ATp plays a prominent role in the transcriptional induction of Th2-type lymphokines. Immunol. Lett. 57:171. Kiani, A., J. P. B. Viola, A. H. Lichtman, A. Rao. 1997. Down-regulation of IL-4 gene transcription and control of Th2 cell differentiation by a mechanism involving NFAT1. Immunity 7:849. Xanthoudakis, S., J. P. B. Viola, K. T. Y. Shaw, C. Luo, J. D. Wallace, P. T. Bozza, T. Curran, A. Rao. 1996. An enhanced immune response in mice lacking the transcription factor NFAT1. Science 272:892. Viola, J. P. B., A. Kiani, P. T. Bozza, A. Rao. 1998. Regulation of allergic inflammation and eosinophil recruitment in mice lacking the transcription factor NFAT1: role of interleukin-4 (IL-4) and IL-5. Blood 91:2223. Oukka, M., I.-C. Ho, F. C. de la Brousse, T. Hoey, M. J. Grusby, L. H. Glimcher. 1998. The transcription factor NFAT4 is involved in the generation and survival of T cells. Immunity 9:295. Peng, S. L., A. J. Gerth, A. M. Ranger, L. H. Glimcher. 2001. NFATc1 and NFATc2 together control both T and B cell activation and differentiation. Immunity 14:13. Wills-Karp, M.. 1999. Immunologic basis of antigen-induced airway hyperresponsiveness. Annu. Rev. Immunol. 17:255. Ray, A., L. Cohn. 1999. Th2 cells and GATA-3 in asthma: new insights into the regulation of airway inflammation. J. Clin. Invest. 104:985. Herrick, C. A., K. Bottomly. 2003. To respond or not to respond: T cells in allergic asthma. Nat. Rev. Immunol. 3:405. Chow, C.-W., M. Rincón, R. J. Davis. 1999. Requirement for transcription factor NFAT in interleukin-2 expression. Mol. Cell. Biol. 19:2300. Rincón, M., R. A. Flavell. 1994. AP-1 transcriptional activity requires both T-cell receptor-mediated and co-stimulatory signals in primary T lymphocytes. EMBO J. 13:4370. Poynter, M. E., C. G. Irvin, Y. M. Janssen-Heininger. 2003. A prominent role for airway epithelial NF-κB activation in lipopolysaccharide-induced airway inflammation. J. Immunol. 170:6257. Takeda, K., E. Hamelmann, A. Joetham, L. D. Shultz, G. L. Larsen, C. G. Irvin, E. W. Gelfand. 1997. Development of eosinophilic airway inflammation and airway hyperresponsiveness in mast cell-deficient mice. J. Exp. Med. 186:449. De Boer, W. I., P. S. Hiemstra, J. K. Sont, E. De Heer, K. F. Rabe, J. H. Van Krieken, P. J. Sterk. 2001. Image analysis and quantification in lung tissue. Clin. Exp. Allergy 31:504. Swain, S. L., A. D. Weinberg, M. English, G. Huston. 1990. IL-4 directs the development of Th2-like helper effectors. J. Immunol. 145:3796. Rincón, M., J. Anguita, T. Nakamura, E. Fikrig, R. A. Flavell. 1997. IL-6 directs the differentiation of IL-4-producing CD4+ T cells. J. Exp. Med. 185:461. Kaplan, M. H., U. Schindler, S. T. Smiley, M. J. Grusby. 1996. Stat6 is required for mediating responses to IL-4 and for the development of Th2 cells. Immunity 4:313. Shimoda, K., J. van Deursen, M. Y. Sangster, S. R. Sarawar, R. T. Carson, R. A. Tripp, C. Chu, F. W. Quelle, T. Nosaka, D. A. A. Vignali, et al 1996. Lack of IL4-induced Th2 response and IgE class switching in mice with disrupted Stat6 gene. Nature 380:630. Takeda, K., T. Tanaka, W. Shi, M. Matsumoto, M. Minami, S.-I. Kashiwamura, K. Nakanishi, N. Yoshida, T. Kishimoto, S. Akira. 1996. Essential role of Stat6 in IL-4 signalling. Nature 380:627. Zheng, W.-P., R. A. Flavell. 1997. The transcription factor GATA-3 is necessary and sufficient for Th2 gene expression in CD4+ T cells. Cell 89:587. Zhang, D. H., L. Cohn, P. Ray, K. Bottomly, A. Ray. 1997. Transcription factor GATA-3 is differentially expressed in murine Th1 and Th2 cells and controls Th2-specific expression of the interleukin-5 gene. J. Biol. Chem. 272:21597. Ouyang, W., M. Lohning, Z. Gao, M. Assenmacher, S. Ranganath, A. Radbruch, K. M. Murphy. 2000. Stat6-independent GATA-3 autoactivation directs IL-4-independent Th2 development and commitment. Immunity 12:27. Ho, I. C., D. Lo, L. H. Glimcher. 1998. c-maf promotes T helper cell type 2 (Th2) and attenuates Th1 differentiation by both interleukin 4-dependent and -independent mechanisms. J. Exp. Med. 188:1859. Kim, J. I., I. C. Ho, M. J. Grusby, L. H. Glimcher. 1999. The transcription factor c-Maf controls the production of interleukin-4 but not other Th2 cytokines. Immunity 10:745. Rooney, J. W., M. R. Hodge, P. G. McCaffrey, A. Rao, L. H. Glimcher. 1994. A common factor regulates both Th1- and Th2-specific cytokine gene expression. EMBO J. 13:625. Rooney, J. W., T. Hoey, L. H. Glimcher. 1995. Coordinate and cooperative roles for NFAT and AP-1 in the regulation of murine IL-4 gene. Immunity 2:473. Smiley, S. T., M. H. Kaplan, M. J. Grusby. 1997. Immunoglobulin E production in the absence of interleukin-4-secreting CD1-dependent cells. Science 275:977. Constant, S. L., J. L. Brogdon, D. A. Piggott, C. A. Herrick, I. Visintin, N. H. Ruddle, K. Bottomly. 2002. Resident lung antigen-presenting cells have the capacity to promote Th2 T cell differentiation in situ. J. Clin. Invest. 110:1441. DiCosmo, B. F., G. P. Geba, D. Picarella, J. A. Elias, J. A. Rankin, B. R. Stripp, J. A. Whitsett, R. A. Flavell. 1994. Airway epithelial cell expression of interleukin-6 in transgenic mice: uncoupling of airway inflammation and bronchial hyperreactivity. J. Clin. Invest. 94:2028. Cohn, L., J. S. Tepper, K. Bottomly. 1998. IL-4-independent induction of airway hyperresponsiveness by Th2, but not Th1, cells. J. Immunol. 161:3813. Rothenberg, M. E., A. D. Luster, P. Leder. 1995. Murine eotaxin: an eosinophil chemoattractant inducible in endothelial cells and in interleukin 4-induced tumor suppression. Proc. Natl. Acad. Sci. USA 92:8960. Schleimer, R. P., S. A. Sterbinsky, J. Kaiser, C. A. Bickel, D. A. Klunk, K. Tomioka, W. Newman, F. W. Luscinskas, M. A. Gimbrone, Jr, B. W. McIntyre, et al 1992. IL-4 induces adherence of human eosinophils and basophils but not neutrophils to endothelium: association with expression of VCAM-1. J. Immunol. 148:1086. Sanderson, C. J., D. J. Warren, M. Strath. 1985. Identification of a lymphokine that stimulates eosinophil differentiation in vitro: its relationship to interleukin 3, and functional properties of eosinophils produced in cultures. J. Exp. Med. 162:60. Foster, P. S., S. P. Hogan, A. J. Ramsay, K. I. Matthaei, I. G. Young. 1996. Interleukin 5 deficiency abolishes eosinophilia, airways hyperreactivity, and lung damage in a mouse asthma model. J. Exp. Med. 183:195. Dent, L. A., M. Strath, A. L. Mellor, C. J. Sanderson. 1990. Eosinophilia in transgenic mice expressing interleukin 5. J. Exp. Med. 172:1425. Crosby, J. R., H. H. Shen, M. T. Borchers, J. P. Justice, T. Ansay, J. J. Lee, N. A. Lee. 2002. Ectopic expression of IL-5 identifies an additional CD4+ T cell mechanism of airway eosinophil recruitment. Am. J. Physiol. 282:L99. Kay, A. B., A. Menzies-Gow. 2003. Eosinophils and interleukin-5: the debate continues. Am. J. Respir. Crit. Care Med. 167:1586. Kips, J. C., B. J. O’Connor, S. J. Langley, A. Woodcock, H. A. Kerstjens, D. S. Postma, M. Danzig, F. Cuss, R. A. Pauwels. 2003. Effect of SCH55700, a humanized anti-human interleukin-5 antibody, in severe persistent asthma: a pilot study. Am. J. Respir. Crit. Care Med. 167:1655.